Brazil made recently substantial economic improvements according to usual economic standards and values issued from the classic liberal model. One may wonder in which extent these improvements as they are determined are meaningful in the real world in which the Brazilian population is living and if the measure tools are not distorted by an improper weighing excluding adequate priorities. We will see that classic tools issued from liberal model give indicators, which are not entirely reliable and which lead Authorities like FMI or OCDE‘s Economic Department (hereinafter referred as OCDE) to base their assessments on signals , which might be unreliable and may thus give a distorted view on certain Countries. Such a distorted view may probably come from the fact that certain analyses do not underline sufficiently the difference between Nations whose substance is their people and Nations viewed as Commercial Corporations. National Economics should assess in priority the Citizens’ welfare. Surveys on Brazil are often an excellent example of the inadequacy of the classic Economic methodology. As a matter of fact, Brazil is a successful country on a basis of usual economics standards, which are unfortunately useless regarding the reality of population’s welfare. Brazil is a federative Republic of 26 States and one federal District including 200 million inhabitants on an area of 8.5 million km2. · Exports of goods: 197.9 USD billion -12.6 % of GDP - 22.1 % p.a. on average over 5 previous years. · Imports of goods: 173.1 USD billion - 11.0 % of GDP - 29.1 % p.a. on average over 5 previous years. · Total official reserves: 192.8 USD billion – i.e. 13.4 months of goods imports. We have excluded GDP at purchasing power parity since criteria (external pricing, basket of goods…) are controversial. · Oil independence and proven reserves guaranteeing the future. · Acceptable unemployment as compared to Western countries. This is sufficient for OCDE to issue a survey in last July advising Brazilian Authorities to alleviate Taxes and Social burden on Corporations to ease their development as a mechanical consequence of such steps. We will show why OCDE’s survey illustrates the inadequacy of classic Economic approach regarding assessment of a reality with traditional Standards. OCDE is thus in line with views of conservative Governments’ blindness. OCDE’s survey includes 140 pages whose substance may be contained in 12 pages, with many appendices such as mathematical modeling of budget elasticity disconnected in our opinion from reality. As a consequence improper recommendations were made to Brazilian Government and few correct observations were made without identifying the roots of the problems. The GDP is not a full secured assessment of a Richness production of a country since it is based on prices determined by agents for their production of goods and services in a context where consumers may not have a moderating power on prices trough an efficient market competition. Value is a consequence of the efficiency of production agents and of the market competition’. In a country where companies are inefficient and the market competition insufficient, GDP may not reflect an objective creation of richness comparable to other countries. On top currency market variations may influence substantially GDP’s valuation. Internal pricing and external currency markets may be together led by speculative targets far from rationality, especially if Government does not make adequate corrections to protect consumers i.e. citizens. 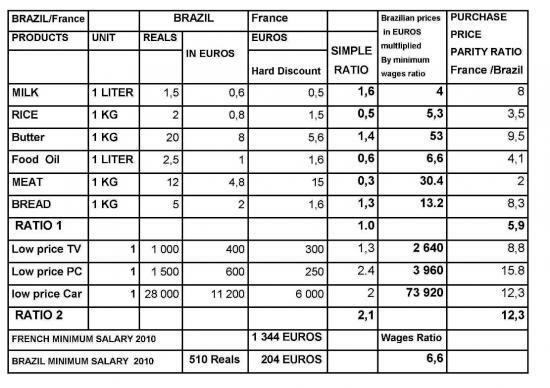 The basic food prices shown on this table are on average similar to those of France in value but on the basis of the Brazilian minimum wage, they are near 6 times more expensive than in France. This is worst regarding products as a simple TV, car or PC 12 times more expansive as well as for any basic domestic appliances. A more detailed research should be made but again this table gives a good indication according to Brazilian consumers. The combination of these factors creates high poverty. The high rate of GDP increase has a limited importance since Brazil is in a phase of development from a low level. Matured Economies have of course more moderate GDP increases. Despite the stringent financial policy of Brazil, external Debt increased by 8% from 2007 to 2008. This might be acceptable if this increase covers import of production equipment. But In fact this increase was due to the incapacity local Banks to provide sufficient Credits. Corporations have compensated the gap by requesting loans from Banks abroad. This index, created by the Economist Coraddo Gini, represents the repartition of national revenues between citizens. 1.0 means than one person receives the whole revenue of the country and zero means than each citizen receives the same revenue. In France this index is 0.33 (quite high for Europe average of 0.31), and is much better in Germany with 0.27 and Sweden with 0.23. This index is near 0.57 in Brazil and expresses a very high inequity between people, whose roots are deep. This index improved a little but is still unbearable particularly if we take into account that President Lula is ending a second and last mandate and was assumed to represent the interest of poor people. This institutional inequality has many roots, which can be seen in my report on Brazilian History dated 4 January 2010 and generates social instability and disorders, which we will develop in the following chapter. This shows that workers do not benefit of the fruits of their works and are mostly exploited to a big extent. The National Revenue is kept in the hands of a small part of the population and its limited amount per capita generates high poverty. The Federal Government could have moderated this situation by increasing direct taxation with the purpose of redistribution in various forms and by reducing substantially indirect taxation which affects in priority the revenues of poor people. Increasing direct taxation may also lead corporations to more managerial efficiency to achieve their targets instead of lulling them with more financial subsidies and alleviations. The Wealth taxation (tax on High Revenues) has been voted but its application is still pending. OCDE thinks that wealth tax should be cancelled despite an evident need of Ethics and solidarity between citizens. We will come back on this issue. Ending with underground economy would have also brought more resources to the Nation but requests more stringent controls. The current federal system generates also much inefficiency and probably prevents the Government to implement of adequate policies at the scale of the Nation but here also recent History of Brazil is resilient at the expenses of the whole Brazilian people. The possibility of reaching in many years, a Gini Index similar to the one of USA as indicated by OCDE does not make sense since USA have a very unfair Gini index of 0.45 for a developed country. Many aspects of USA as revenue repartition, Social protection and access to Education should be corrected and this is the target of President Obama. Nevertheless these inequalities are more tolerable in USA because of their very high GDP i.e. an unfair repartition may still give a decent minimum Revenue per person [Federal minimum wage in USA is USD 1250 (900 Euros) and is much higher is many States]. This situation has nothing to do with Brazil. According to Brazil 31% of its population is under poverty line (2005). This figure is by far underestimated according to more acceptable criteria as presented below. They are many ways to assess poverty line like earning of less than 1.4 Euros per day (USD 2) or daily food representing less than 2200 calories. In France poverty line definition is much higher in value with 50% of the median wage, but European Union prefers 60% of median wage. According to French criteria poverty line is 733 Euros per month for one single person (population below poverty line in France was 6.2% of the whole population in 2004). Population below poverty line is in appearance bigger in Germany than in France but in Germany the threshold is 1 764 Euros as compared to only 733 Euros in France i.e. 2.4 times more. With a more reduced Gini Index and a much higher poverty line threshold Germany appears to be a more social country than France. In Brazil 54 Millions of people i.e. 27% of the population has less than half of the minimum wage (see www.brasilescola.com), which means that 27% of the population lives with less than 100 Euros per month. Brazil is discreet regarding figures on real poverty. According to “Ministerio do Trabalho” the median wage of teachers was 943 Reals in 2004. Even if increased to an assumed figure of 1 200 Reals, this gives 480 Euros, which is less than 65% of French poverty line, this is significant since prices in Brazil are similar or higher than in France. We might assume than more than half of Brazilian population is under poverty line according to French criteria and in the context of high Brazilian prices. As a matter of fact, many Brazilian prefer to buy basic domestic equipment abroad if they can afford to travel. Brazilian Airlines authorizes passengers to bring luggage of 64 kg per person with cost of only 85 Euros by additional 32 KG. If probably the majority of Brazilian people live below poverty line, most of them live in poverty according to French criteria. The new minimum wage of 510 REALS i.e. 200 EUROS does not permit to live. The basic need is food composed traditionally of rice mixed with beans (feijão) to form a kind of nutritive mash consumed regularly everywhere in Brazil. With such revenues lodging is difficult after having paid food, and many families’ members may share a same lodging or build a free one in Favelas. Favelas are thus an economic necessity for many people due to their purchasing power. Favelas are everywhere in Brazil and accepted by the whole population and Authorities as a normal lodging. The large population of Favelas cannot afford the payment of lodging. Normal lodging rented or bought is in the vicinity of European level in big cities. Favelas may be in simple wood planks against a wall or built with more solid materials; the persons inside have no property rights and may be expelled at any moment. Favelas are favorite places for drug trade and might suffer gang laws since police presence is punctual in such places which do not exist officially. They concentrate high criminality. Favelas built with solid materials remind in certain aspects the Palestinian camps. They are due to inadequate social policy and unfortunate traditions of the country. Police is thus not an adequate response to the problem of Favelas. The adequate solution is a social policy permitting to lodge decently population of Favelas in normal districts. This could be an excellent challenge to achieve before Olympic Games, instead of developing Police squadrons to welcome future spectators of the Games. Deprivation does not bring lot of expectations to most of people; drugs and alcoholism is common way of consolation. On top insufficient remuneration from work leads among others many people to find additional money in criminality. Many figures are published regarding murders in Brazil. In 2009, many sources reported 55 000 murders committed in Brazil, which represents a rate of near 28 murders for 100 000 inhabitants. As a big country Brazil seems to rank number 3 (more or less same ranking as Venezuela) in term of murders index just after Colombia (number one) and South Africa (Number 2). Murders are more concentrated in cities and risk varies from one to another city. If we consider the 3 main cities of Brazil, Belo Horizonte ranks first with a rate of 49 murders for 100 000 inhabitants, followed by Rio de Janeiro: 38 and Sao Paulo: 24. From 1998 to 2009 Brazil has known a regular and substantial increase of population in jail from 102 for 100 000 inhabitants to 242 for 100 000 inhabitants (Index in France and Germany are around 90). The population in Jail is near half a million people in a premises made for a maximum of 260 000 persons. Prisons are overcrowded and are crime schools. Emperor Peter II of Brazil was overthrown in 1889 because he abolished Slavery of Black people in 1888. After slavery of Black people, the new Republic of Fazendeiros (Big Farmers) created the new slavery of white people. Today we may consider that a minimum wage of 200 Euros is an official recognition of Slavery, but this is not enough, many companies hired people informally to avoid paying social charges and minimum wage. But this is not enough, many organizations recreate pure slavery. Delinquent people go to poor villages and hire people to work far from their home and family in order to make them vulnerable. On arrival on work site (often Cane culture for ethanol production replacing car oil in Brazil or Cattle Ranches), the recruiters “Gatos” inverse the situation and explained to the workers that they are debtors because of food and transport and that they will not be paid for their works. The last figures were published in 2003 by United Nations indicated that about 25 000 to 40 000 slaves were exploited in Brazil. More recent estimations are at about 25 000 slaves, mainly as above mentioned are exploited in Cattle Ranches and sugar cane plantations. Mobile inspection Groups were created in Brazil to limit slavery and since 1995 have freed 33 000 slaves in Brazil. The record number was recent since 6 000 slaves were freed by the police in 2007. The importance of this recent operation is particularly worrying regarding slavery in Brazil. But Slavery might be more insidious since any people may have one of several domestics for 200 Euros per month each in total legality. We also remind (See my report dated 4 January 2010) that Brazil do not recognize Indians as full citizens; they have a status of minor as children. On the other side of the border in French Guyana, same Indians are full citizens of France and Europe. This situation contravenes Human Rights Declaration that Brazil has signed. Education is the corner stone of a country future. There is a tax earmarked to Education, which is useless according OCDE’s opinion and this organization thinks that in term of share of GDP dedicated to Education, Brazil is in lines with OCDE’s countries. The last figure known is 4% of GDP in 2004 as compared to 5.7% in France. OCDE forgot that Brazil population: 200 million is one of the most important among countries and that Brazilian GDP is very limited. Consequently comparing Education budget of a country with others as a percentage of GDP is totally meaningless. Education depends on population and should be particularly important for a country aiming to develop. Education should be a top priority for Brazil. Contrary to OCDE we think that effort on Education should be bigger in percentage of GDP but adequately invested. As fairly mentioned by OCDE the standardized International tests – PISA- demonstrate a strong deficiency of Brazilian Education system. Level of High schools is substantially inferior to those of OCDE. Students and people in general seem to have visible educational gaps. English and Spanish teaching would help students to have access to a wider culture but teaching of foreign languages is very deficient. Most of Brazilian lives in their country as in a huge Ghetto and have a vague idea of other countries, including the very close countries of MERCOSUL. Few of them travel and fewer travel abroad. Portuguese learning is encouraged in the surrounding Spanish speaking countries but Spanish is hardly spoken in Brazil. This factor participates to stagnation since Brazilian citizens have not enough external comparison references to feed their requests for a Nation change. The number of general courses in secondary Schools and High Schools per annum is insufficient and concentrated in the morning only. Teachers who are themselves the products of this system do not seem to have a sufficient competence to remedy the education system deficiency. Rich families have recourse to private Schools and external private teachers to compensate part of these deficiencies. The final high school graduation does not open the doors of Universities. Another graduation per University and selected field is necessary named “Vestibular” and is valid in the same year of exam only. At University courses seem also reduced as compared to western countries e.g. physicians (Medicas) do not obtain MD (Doctorate graduation) but a post graduate professional diploma since studies are limited to 6 years as compared to 9 in France. Contrary to OCDE’s indications, progress should be continued in health Brazilian sector. Most of Cariocas including the police seems to have no idea where it is and the signalization to reach it permits only to make round circles in the city; a map is necessary to locate the museum. This is probably a main museum in Brazil since Rio was a long time the federal capital city. Its size is similar to a small museum of small cities of France (for example Caen in France has much bigger museums), without clear organization and explanations. Various objects are accumulated and a good knowledge of the country’s History is requested to appreciate some of them. [The original torture cross of Tiradents, the National Hero, is simultaneously and miraculously present in the Museum of Rio de Janeiro and in the one of Ouro Preto (State of Minas Gerais)]. Visitors in touristic season seem to represent a smaller number than the museum guards who wear surprisingly battle dresses with truncheons or guns. Changes should be done before Olympic Games. It has the size of a big flat on one single level with nothing interesting in it e.g. old pictures and old work instruments with no explanations. Guards wear civilian dresses but are clearly surprised by the presence of visitors. Oil might help marginally the country development. Oil is no more the planet future and revenues depend on production costs. According to OCDE, new fields were recently discovered off the country’s south-eastern coast. As a matter of facts, these new reserves are located in deep waters, below a thick salt layer at about 2 500-5 000 meters below the seabed, which renders production technologically complex and costly. The reserves are also distant from the coast, which poses logistical challenges. On top oil concerns few States, which do not wish to share their resources with other States. We will see that the current federal organization is a brake for the Nation development.